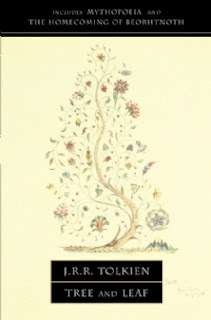 Again, you might find it surprising that I've chosen to review this particular work—one of the very few fictional works published by Tolkien that are not tied into the Silmarillion (others include Farmer Giles of Ham, Roverandom, Smith of Wootton Major, and The Homecoming of Beorhthelm Beorhtnoth's Son) but I have chosen it because it is a strange and beautiful allegory of Tolkien's own creation. I will quickly summarise it here, beginning to end; if you haven't read it, it would be much better for you to read the whole thing yourself quickly before I give it all away. It is really only a short story, and very good. It had begun with a leaf caught in the wind, and it became a tree; and the tree grew, sending out innumerable branches, and thrusting out the most fantastic roots. Strange birds came and settled on the twigs and had to be attended to. Then all round the Tree, and behind it, through the gaps in the leaves and boughs, a country began to open out; and there were glimpses of a forest marching over the land, and of mountains tipped with snow. Niggle lost interest in his other pictures; or else he took them and tacked them on to the edges of his great picture. Niggle's picture distracts him from mundane things like growing potatoes or talking to visitors, but as the start of his journey grows closer, he begins to realise that he will just have to stop expanding the picture and finish it. Actually it seemed to him wholly unsatisfactory, and yet very lovely, the only really beautiful picture in the world. Time goes by and Niggle realises that he must take his journey very soon. But just as he is hard at work trying to finish the picture—time is running out—Mr Parish needs help, and then Niggle gets sick, and finally an Inspector arrives. 'Your neighbour's house is not satisfactory at all,' said the Inspector. 'I think it is a case for a little gentle treatment now,' said the Second Voice. Niggle though that he had never heard anything so generous as that Voice. It made Gentle Treatment sound like a load of rich gifts, and the summons to a King's feast. Then suddenly Niggle felt ashamed. To hear that he was considered a case for Gentle Treatment overwhelmed him, and made him blush in the dark. The curves of the land were familiar somehow. Yes: the ground was becoming level, as it should, and now, of course, it was beginning to rise again. A great green shadow came between him and the sun. Niggle looked up, and fell off his bicycle. Before him stood the Tree, his Tree, finished. The landscape is beautiful, right, enchanting—the way he imagined it, but failed to paint it--but it still needs work. And suddenly he wishes that he had Parish with him, for Parish knows about trees and gardening...Indeed, Parish turns up, and the two of them collaborate on finishing the picture. Oddly enough, it was Niggle who became most absorbed in building and gardening, while Parish often wandered about looking at trees, and especially at the Tree. Finally Niggle is ready to move on to the Mountains, happy in the knowledge that his picture is finished and far more glorious than it ever could have have been before. The story finishes with two men discussing Niggles's work. In Niggle's hometown, he is quickly forgotten. 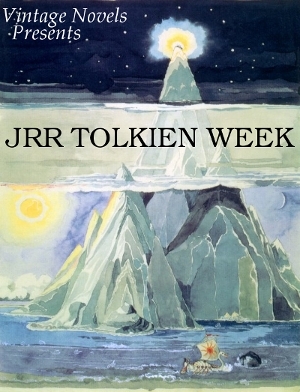 This is a many-sided little story, articulating many of Tolkien's fears and desires about his works. What value do our artistic works have in God's creation? One side of the story deals with Tolkien and Niggle. Like Niggle, Tolkien was a perfectionist and a procrastinator tempted to view covenant, community life as a distraction from his work. Like the picture of the Tree, the legends of Middle-Earth were a magnificent undertaking, constantly being added to, worked and reworked in painstaking detail. Tolkien may have worried that his works would die with him, and Leaf by Niggle demonstrates his hope that God would accept his works and glorify them even if they were forgotten here. Of course, Mr Parish is Niggle's neighbour whom he must love as himself, the journey Niggle must take is death, the Mountains must be Heaven, and the Workhouse and Niggle's Parish are supposed to be Purgatory. Despite the theological differences here, I love Leaf by Niggle for the way in which it discusses art, life, and hope. I love the fact that Mr Parish in the end becomes indispensible to the picture; some of the best parts of it are those in which he and Niggle collaborate, so that in the end the most utterly glorious parts of the art are those which Parish affected. There is no duality here between art and loving one's neighbour: loving one's neighbour is a work to be glorified in the world to come, and the purpose of art should be to love one's neighbour. It is the enduring legacy of Niggle's Parish that it forms the best introduction to Heaven. This is partly what CS Lewis was trying to do in The Chronicles of Narnia—reintroduce people to a distinctively Christian view of the world. It seems from Leaf by Niggle that Tolkien hoped the beauties of Middle-Earth would also form an excellent introduction to true, heavenly, truth, beauty and goodness. In addition the work deals with the place of sub-creation within creation. Humans subcreate, Tolkien argued; the question is not whether they will do so, but whether they will create things that echo and give glory to God, or whether they will mock and twist God's creation and truth, seeking to become an independent creation. Tolkien hopes that his work does give glory to God. So it may be said that the chief purpose of life, for any one of us, is to increase according to our capacity our knowledge of God by all the means we have, and to be moved by it to praise and thanks. To do as we say in the Gloria in Excelsis: Laudamus te, benedicamus te, adoramus te, glorificamus te, gratias agimus tibi propter magnam gloriam tuam. We praise you, we call you holy, we worship you, we proclaim your glory, we thank you for the greatness of your splendour. The artist's work gives glory to God in that it is his response to God's glory—the evidence of his yearning to mirror, to echo back, some of the grandeur and beauty that he sees. However, Tolkien also recognised that his work was never going to be perfect in giving glory to God. Instead, he hopes that God will accept and perfect his works; that he himself, perhaps, will be given the chance to assist in their perfection and glorification, so that the reflection they provide of God's glory can become pure and clear. 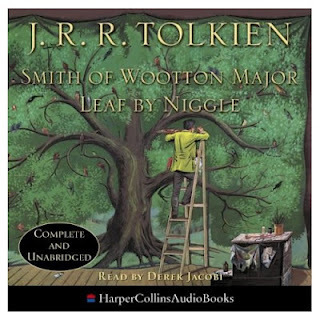 Leaf by Niggle is so important because it is Tolkien's own apology for his work; an odd, beautiful, poetic apology, clearly showing where his treasure was laid up. Couldn't have said it better myself! I love Leaf by Niggle:). Hello, I was wondering if someone can tell me where the print of Niggle on the bike first seeing the tree came from? I would love to purchase a copy to frame. Thank you! Hello, Rachel! 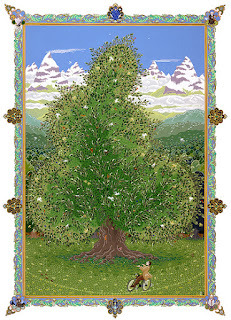 The painting of Niggle seeing the tree for the first time is by Ruth Lacon, I believe. Rachel, thanks for the kind words!